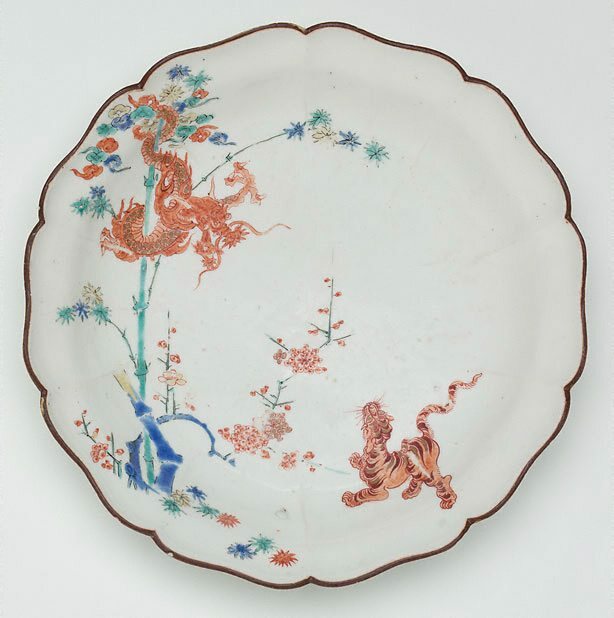 Characteristically for Kakiemon, the design on this dish is Chinese (a tiger and dragon) executed in vibrant enamel colours, while the body is a warm, rich white against which the motifs are delicately and sparsely placed. Typical too of Kakiemon is the rust-red coating on the rim. In Europe a passion developed for Kakiemon porcelain, where it was first copied by Meissen and later in England by the Chelsea, Bow and Worcester factories. In fact, before its acquisition by the gallery, this piece had mistakenly been exhibited as Chelsea. The Asian Collections, AGNSW, 2003, pg.262.